The other day I went to pass on my delicious (and SUPER easy) crockpot buffalo chicken recipe to a friend, when, much to my dismay, the link was broken. Hellllloooo. Internet? Where is my go-to-number-one crockpot buffalo chicken recipe? No dice. But, then I realized it provided me with the opportunity to share it with you and pretend it was my fantastic idea all along. I can't even get to the link to give credit where credit is due. So let's just pretend I'm a genius and I'm sharing my genius with you. Definitely had to look it up to make sure I had spelled genius correctly. That would have been an unfortunate mistake. So on night number one, I like to fix up my crockpot buffalo chicken into a sandwich topped with a little (or a lot) of Monterey Jack cheese. Typically with some nice roasted potatoes on the side and a salad if I'm feeling the need for something with some nutritional redeeming qualities. 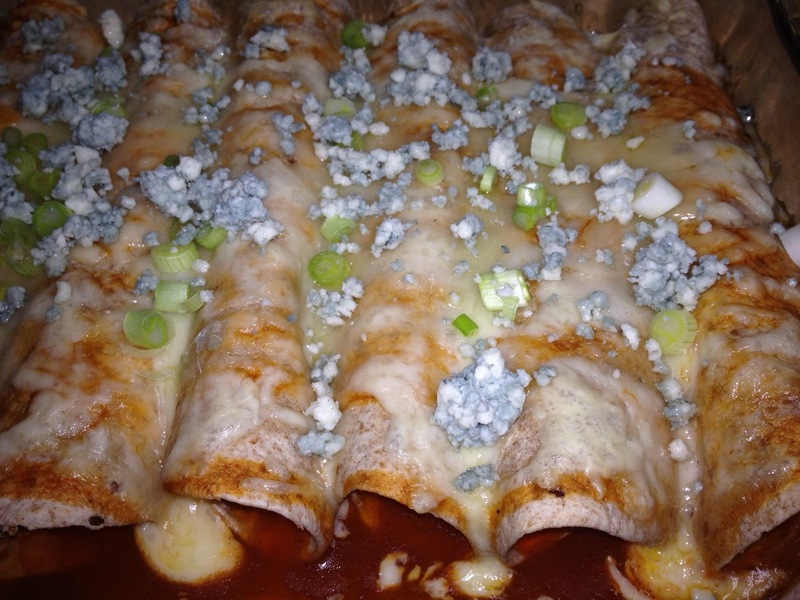 Buffalo chicken enchiladas. They are incredible. So here it is. My genius unveiled. And I have apparently passed my genius on because my kid found both of her feet today. At the same time. I have been waiting for a few days for her to achieve this feat. And yes. Pun intended. 1. Put chicken, wing sauce, and Ranch Dip mix into your crockpot. 2. Cook on low 5-7 hours (the 7 hour extreme would be more for if you are using frozen chicken). 3. Shred your chicken with 2 forks and return it to the crockpot for another 30 minutes to soak up all the buffalo deliciousness. 4. Eat it directly out of the crockpot or fix it up anyway you like. Pour half of the red enchilada sauce into your sprayed baking dish to just barely coat the bottom. Mix the leftover crockpot buffalo chicken, 2 green onions, and 1/2 cup monterey jack cheese in a bowl. Fill each tortilla with some of your chicken mixture and then roll your tortillas and place seam side down in your baking dish. Pour the rest of the enchilada sauce over top of your tortillas and top with the rest of the monterey jack. Remove from the oven and top with gorgonzola cheese and the rest of your green onion. Yumm, that buffalo chicken recipe may have just become contender #1 for my Superbowl spread. Has Nora put her feet in her mouth yet? Now that is some entertainment.